The Public Peace Prize was established during the 24 Hours for World Peace event which brought together more than thirty organizations and thousands of Internet users during the World Day of Peace on January 1st, 2014. Specially created in order to promote greater recognition of peacemakers by the general public, the “PPP” introduces a new approach by which the public proposes candidates and then votes themselves, acting as jury members. All in all, participants entered 4450 votes between February 18th and 28th, 2014 in order to mark their appreciation for the candidates they chose in each of three different categories. 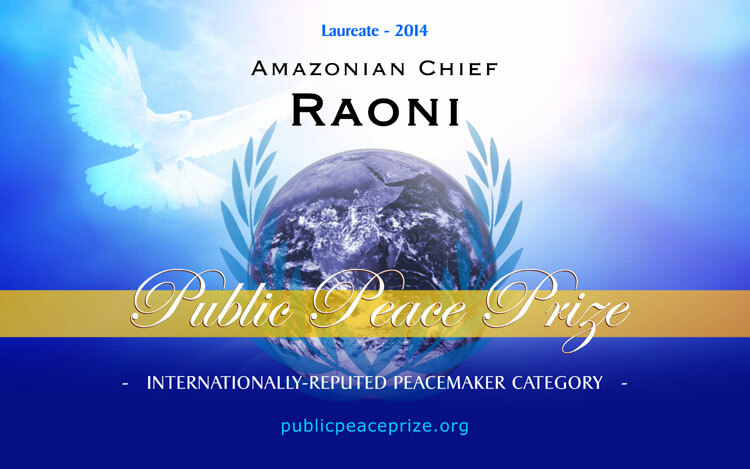 We have the pleasure of divulging the name of the laureates of the first edition of this brand new peace prize. In this category, two candidates clearly benefitted from impressive social networking support from the public; Raoni the Amazonian and the Palestinian doctor Izzeldin Abuelaish. Between the two of them, they collected 85 % of all votes*. *(Compilation of all votes entered on the French site, the English site, and those received by email). The public also wanted to underline the nomination of Pope Francis (7% of votes*). The percentage of votes entered for Chief Raoni added up to 48%. * The Amazonian Chief’s candidature was the highest on the French website. 37% of all votes* went to the Palestinian doctor Izzeldin Abuelaish. He finished in first place on the English webiste. 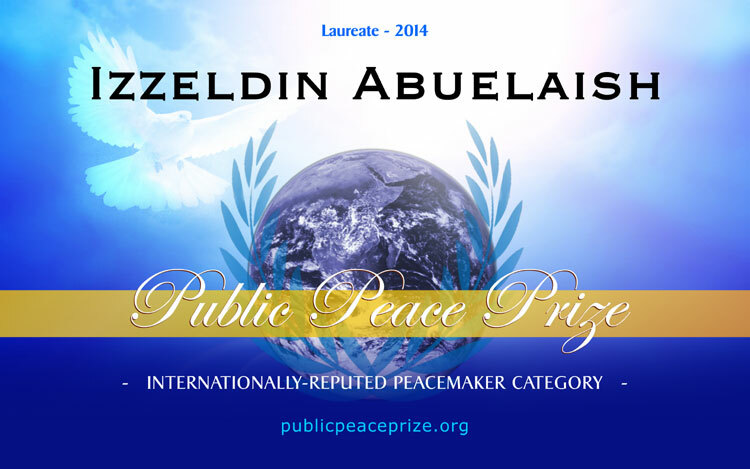 As we wish to recognize the enormous tribute paid to both of these peacemakers by the public, while at the same time encourage a more peace and participative approach to a competitive one, the Public Peace Prize committee decided to grant the 2014 International prize to each of these two candidates. 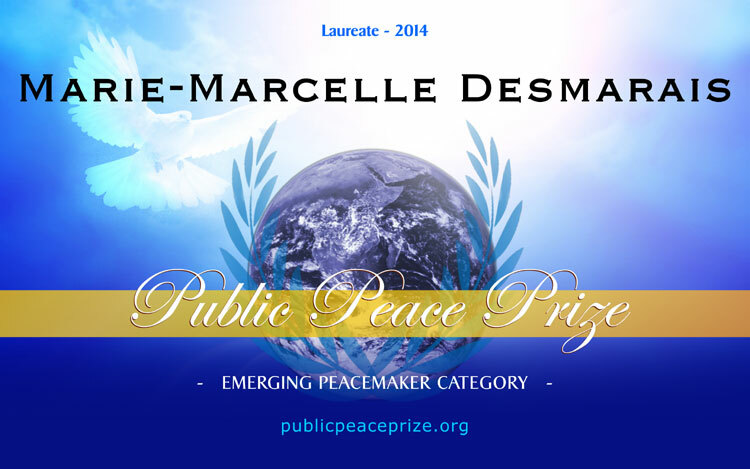 The “Emerging” prize seeks to recognize peacemakers whose influence goes beyond the local or national arenas, but are not yet identified on an international level. Marie-Marcelle Desmarais received 37% of votes*, followed by Jacques Bélanger (23% of votes*) and the African organization “les Héritiers de la justice” (14% of votes*). This “local” prize seeks to recognize the impact of people who, even on a modest scale, contribute in a significant way to peace and reconciliation in their community. 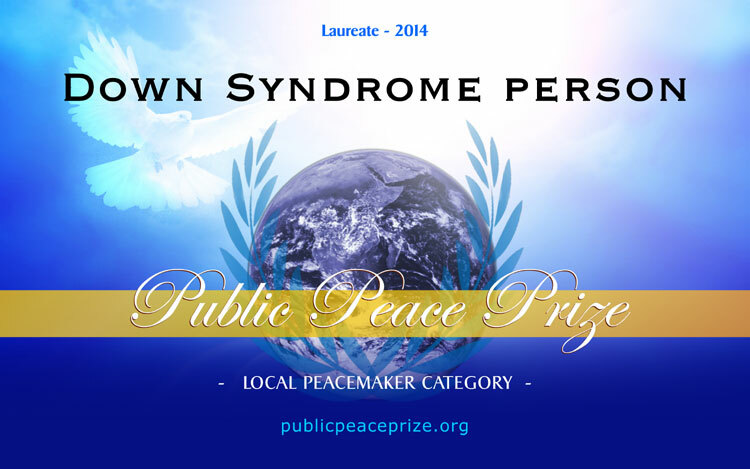 Since a specific name was not specified at the time of this nomination, this prize goes out to all people with Down’s Syndrome for their “a real ability to diffuse peace around them”. This candidature received 46 % of the votes* in this category. Congratulations to the laureates, to the causes they fight for and to all the other people nominated by the public! Finally, we wish to specify that the appreciation and the support for the peacemakers and the peace initiatives around the world are more important to us than the designation of laureates. With this in mind, we invite you to read the profiles of the different people who were nominated in all three categories as well as the percentage of votes attributed by the public.